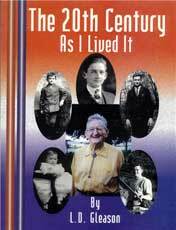 This 97-year-old author recounts that remarkable century. He skillfully weaves his own family and career details within the changing settings from WWI, to pre-Depression days, through the Great Depression, WWII and the post-war period. He offers honest opinions and interesting insights into political, economic and social circumstances during each decade through the 1950s, also offering perspectives on his own successes and failures. 8½ x 11, SB, 193 photos, 194 pages.